You are a limitless being of infinite light because you are made of light. You are no less than me, for you are an exact replica of me. Your consciousness is omnipresent, which means you can exist in multiple places at the same time. Although you may only be aware of having a linear third and fourth dimensional existence, you actually exist as a multidimensional being, and this is how you are able to bring fourth dimensional manifestations into physical reality. Whenever you perceive something, define what you believe to be true, and react to circumstances through your emotions, you are directing the vibrational output of your consciousness. As an energetic being, you are constantly radiating energy out into the universe. Your vibrational output is influenced by your perceptions and reactions, and this is based on the beliefs you carry with you. Your energetic frequency will vibrate faster when your thoughts and feelings are positive, and it will vibrate slower when your thoughts and feeling are negative. The faster your consciousness is vibrating, the more familiar you will be with the multidimensional aspects of yourself because you will be able to transcend the time-space limitation of the third dimension. The only limitations are those created by the ego, which are the imaginary boundaries you have chosen to impose upon yourself, affecting your potential. Creation itself, is infinitely abundant and since you are part of creation, there are no boundaries in the universe or within the constructs of consciousness. When viewing reality from a third dimensional perspective, it can be challenging to remove boundaries and limitations, but when you learn how to be the master over your thoughts and beliefs, higher dimensional versions of yourself will emerge, and you will come to know yourself as a multidimensional being. This chapter will acquaint you with your multidimensional nature by helping you acknowledge and release the blockages that have been preventing you from knowing your unlimited, multidimensional self. It is important to know that you are not your body and you are not the brain attached to your body. 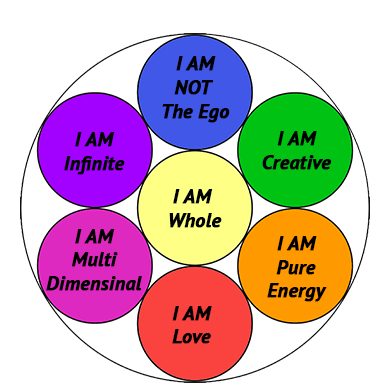 You are not your ego. If you believe that your body is YOU, then you will not know your infinite self. 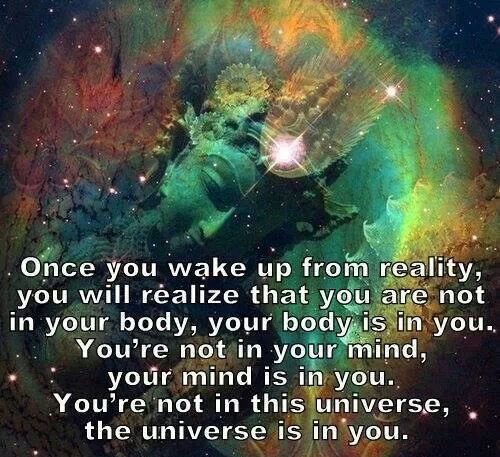 Your body is only a vehicle that allows you to experience physical reality, but it is not the whole of who you are. Your body operates much like a car, and you are the driver of your car. As a multidimensional being, you exist beyond the third dimensional constructs of linear space and time. When you meditate, pray, imagine, focus your intentions, and have visionary experiences that move through your heart, you can access multidimensional aspects of yourself, which are likened to stepping outside of a car. This is where you will discover that a larger world exists all around you. If you always remain inside your car, you will only see the world through a windshield. You can experience a deeper, more meaningful life by simply changing your focus and tapping into other levels of consciousness. This chapter will explain how your consciousness is woven throughout the fabric of the universe, because every vibration that exists in the body of creation is always linked to you. When you ask to know more, you will. When you want to see more, you will. When you know that your beliefs, attitudes and choices directly shape your life, you will begin to see yourself as a co-creator and an alchemist, who can shape whatever you want into physical reality. When you come to know your multidimensional nature, you will be set free from all limitations and you will be able to experience a world that is much greater and richer than you once thought.